2. 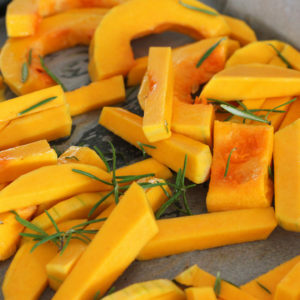 In a medium-sized bowl or zip lock bag, toss squash with 1 Tablespoon olive oil. 3. Arrange butternut squash on baking pan. Roast until fork tender, about 25-30 minutes. Set aside. 4. In large skillet, heat remaining oil over medium-high heat. Add mushrooms, garlic and pinch of salt and sauté 4 minutes. 5. Add sage leaves and continue sautéing 2 minutes. 6. Mix in squash. Continue to sauté another minute. 7. Season to taste with pepper and serve warm garnished with cheese.